Traffic flow is a common reason that clients want to renovate their kitchen, including the owners of this home in Palma Sola Park. Access to the kitchen was cut off from the home’s entryway, either routing through the dining room or the family room to enter the kitchen from anywhere in the house. 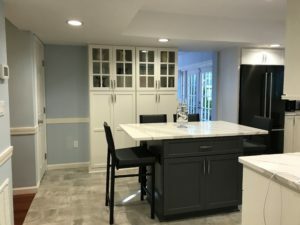 Other problems the homeowners wanted solved were permanent seating area in the kitchen, additional storage, an updated look, and more visual interest. At the same time, they wanted to keep with the look of the traditional home. A solution to several of these problems came by removing the wall separating the kitchen from the entryway and annexing an awkward hallway behind it into the kitchen. 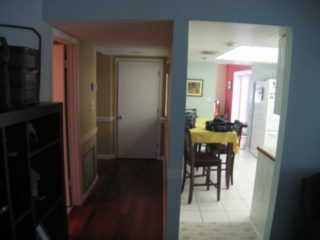 This allowed direct access to the kitchen from the family room, dining room, entry, and garage. The extra floor space allowed for an acceptable island with both seating for 4 and additional storage. It also made room for additional pantry storage that did not exist before. While still not a large space, the new kitchen plan allowed for plenty of balls and whistles requested by the clients. These included lazy susan shelves in the corners; deep drawers to store pots and pans; a pull out for spice storage; dual trash cans. They even gained some display space with glass doors to show off some favorite serving pieces. The client knew she wanted the island to be a noticed. 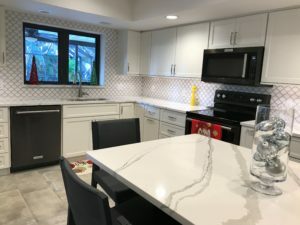 By selecting StarMark’s Peppercorn, a dark gray accent color, for the island to contrast with the soft white Dove for the perimeter storage was her choice was simple. The stunning Brittanicca quartz counters from Cambria weave together both colors perfectly. More importantly, the choice of counters continued the idea of ‘flow’. Brittanicca, a member of Cambria’s Luxury Series, mimics the movement of natural stone while still providing the low maintenance and lifetime warranty that quartz composites afford. A coordinated marble tile pairs perfectly and also creates a natural focal point in the negative space around the kitchen window. The flowing arabesque shape of the tile is reminiscent of the soft, curvilinear pattern found in the counters. Each gives the other purpose in this elegant and simple room. This entry was posted in Kitchens and tagged Arabesque tile, Brittanicca, Cambria, Dove White, gray, Island, kitchen, Peppercorn, renovation, seating, StarMark, stratford, white. Bookmark the permalink. We found our kitchen remodeling to be a perfect job. Every aspect we asked to be included was fitted neatly and in user-friendly fashion. The layout of the room with a definite angle made proper design important. Scott was always readily available to answer any concerns, checked frequently during the installation and constantly made us aware that the aim of Duncan Kitchens was to meet our needs in a satisfactory manner. That was truly accomplished.